As the demand for SAFe expertise accelerates globally, there is a growing focus on the Scrum Master and the critical role that person plays in a SAFe implementation. 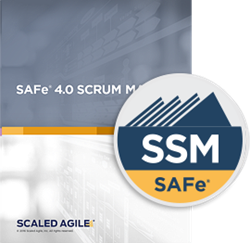 Scaled Agile, Inc. (SAI), provider of the Scaled Agile Framework® (SAFe®), today announced the release of a new course and certification: SAFe 4.0 Scrum Master (SSM). In addition to teaching Scrum fundamentals, this course is for professionals who want to gain an understanding of the role of Scrum in the context of the SAFe enterprise, and learn how to coach teams to deliver the maximum achievable business value. The two-day course prepares Scrum Masters to take a leadership role in facilitating Agile team, program, and enterprise success in a SAFe implementation. Students will learn to successfully plan and execute the Program Increment (PI) Planning event, the primary enabler of alignment throughout all levels of a SAFe organization. They will also learn the key components of scaled Agile development, how to participate and optimize the flow of value throughout the enterprise, how to facilitate and participate in successful iteration and PI execution, and gain insights into building high-performing teams. Upon passing the exam, students will receive the SAFe 4.0 Scrum Master (SSM) certification. Information about the course, and a sign-up form for those wanting to be notified when public classes are available can be found at scaledagile.com/scrum-master. Based in Boulder, Colorado, Scaled Agile’s mission is to help system and software-dependent enterprises achieve better outcomes, increase employee engagement, and improve business economics through adoption of Lean-Agile principles and practices based on the Scaled Agile Framework® (SAFe®). SAI supports tens of thousands of practitioners of the Framework through training, certification, consulting services, and a global partner network that reaches over 35 countries and 350 cities. As a contributing member of the Pledge 1% corporate philanthropy movement, SAI also seeks to make a direct and positive impact on the community, and encourages other companies to do the same. Learn about Scaled Agile, Inc. and the Scaled Agile Framework, at scaledagile.com and scaledagileframework.com.